It took me a while to come up with a daily dose today, I actually didn't give it a title because I was a bit disappointed. After a week of several doses of a bitter reality, along with the hills and valleys of a very fast moving emotional roller coaster, I was done! Honestly, my Friday was perfect. While I was still on a high from Friday, the sadness that overwhelmed me on Saturday made me realize that precious moments, as well as people, are to be cherished. Even in that, I could still see the silver lining in it all. Sunday was shaping into another good day. I reconnected with a few very familiar people that were an intricate part of what made me ME. I then realized that I missed those in person connections that were replaced with words on a small screen in an impersonal setting, called social networking. Sunday evening was filled with my normal weekly hustle and bustle. Sunday night became challenging when my car would not start. I was busy this weekend! The message that I received last night was that God has a way of slowing you down when you are moving too fast. The thought of this made me reflect on many things as well as people and how certain relationships impact my life. I always refer back to the statement, “When People Show You Who They Are, (THE FIRST TIME), Believe Them!” I must admit, I’m saddened at the character flaws that have appeared in the people that are around me. It’s ironic that people that have no real association with you have more common courtesy than those that are an intricate part of your life. I received another message last night as well. The young man, that stayed behind to assist me with my car said that most people today are “Opportunist”. It’s funny, but I use that word a lot, actually more than I would like too. Unfortunately the statement is absolutely true. We do not possess the spirit of common courtesy anymore. People live by the “Crab In A Barrel” syndrome. It’s almost as if we can no longer trust those that appear to be genuine because we’re always trying to interpret the hidden agenda behind the smile. We have to walk around guarded because of predators that lurk around trying to capture their next prey. The dose of reality was real yesterday, and it has caused me to place a much needed filter on my personal interactions as well as my permeable personality trait that allowed the crabs to get in. 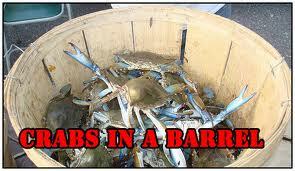 The funny thing about the crab is, as it pulls the other crabs down, it falls in the barrel too! Proverbs 21:8 tells us that, The way of the guilty is crooked, but the conduct of the pure is upright.